Two full-time college counselors guide students and their families at every step. Our counselors provide personal attention and top-notch information that focuses on the unique needs of each student. Mayfield’s college counseling program prides itself on the caring guidance, support and advocacy of each student as she makes her way through the college admission process. We believe this process is an extension of her Mayfield education requiring solid research, self-reflection and thoughtful analysis. The college counseling program at Mayfield Senior School prides itself on the personal guidance, support and advocacy of each student as she makes her way through the college admission process. We believe this process is an extension of her Mayfield education requiring solid research, self-reflection and thoughtful analysis. This necessitates looking beyond college rankings and discovering those universities where her unique gifts will be challenged and nurtured in order for her to truly flourish during the undergraduate years. The college counselors educate students and parents on colleges, admission standards, trends and procedures in order for students to match their personality and goals with institutional communities and offerings. We believe in savoring the opportunities each young woman has and delighting in the thrill of the search. As with all aspects of a Mayfield education, we care deeply about our students and it’s a joy to walk alongside them throughout this journey. How well a college matches the individual student's needs is the driving force behind our search process. We get to know the students through individual and parent meetings, weekly meetings as a class during senior year, questionnaires, as well as in their leadership roles and extracurricular activities. At Mayfield, this process is a partnership between the students, their parents and the counselors. Unlike many other high schools, we choose not to split each class amongst our two counselors. Rather, every student gets the full advantage of both counselors' knowledge and experience. They meet with both of them and feel free to access either one. The college counselors guide each senior in choosing a list of potential colleges emphasizing a good "fit" — communities where she can flourish personally and academically. Fully aware that there is no substitute for a campus visit, the college counselors stay current by touring multiple colleges each year. Our College Counseling office calls it “The Good News” list—the spreadsheet showing that, as of this week, more than 85% of Mayfield seniors have received early acceptance notices from colleges and universities including Bates College, Boston College, Duke, Fordham, Georgetown, Harvard, Loyola Marymount, Santa Clara and Stanford. The ACT is an achievement test, measuring what a student has learned in school and follows high school curricula closely. The new SAT is an evidence-based test, and focuses on synthesis and analysis. 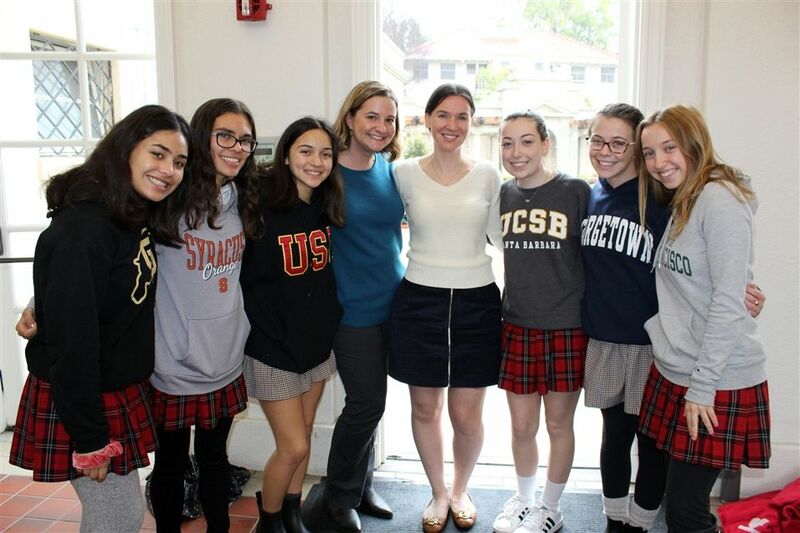 During senior year, the college counselors meet with the entire class on a bi-weekly basis to co-teach a seminar on all aspects of the college admission process. Cumulative grade-point-averages are calculated using all graded courses taken at Mayfield, starting in the 9th grade. 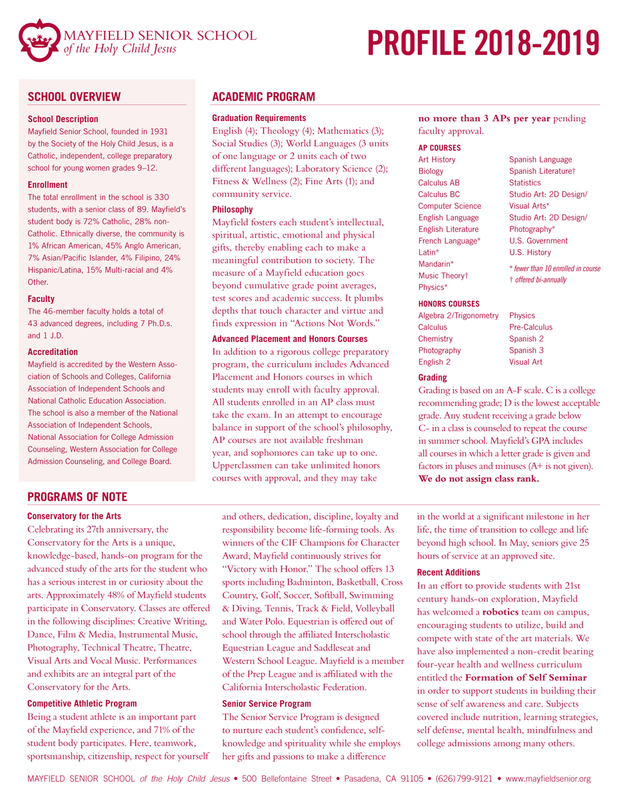 As seniors are readying themselves for the college experience, Mayfield Senior School provides two meaningful programs. Mayfield does not rank students because of many, many of our Seniors are highly accomplished students academically. Samantha Pieper is Mayfield’s Associate Director of College Counseling. Samantha has previously served as a high school counselor in independent schools and got her start at Saint James School in Montgomery, Alabama. She received a Bachelor of Arts in communication from the University of Indianapolis, with an emphasis on public relations and human communication, and a Master of Education in School Counseling from Auburn University. While attending the University of Indianapolis, Samantha was a member of the speech team and traveled across the country to various tournaments. She credits the speech team for teaching her how to write and present effectively. Samantha also had the opportunity to serve as Hall Director while enrolled at Auburn. She is a National Certified Counselor and holds a Pupil Personnel Services credential. Samantha is passionate about being an advocate for students and setting them up for postsecondary success. She is excited to be a member of the Mayfield community and to empower young women on their transition to adulthood. Her favorite moments are the "enrollment glow" when students choose where to attend after high school and also seeing students serve their communities with passion and glory. In her free time, Samantha loves to bake, read fiction novels and memoirs, and go on runs and hikes with her dog, Mason. It’s hard to think about the college admission process when you first walk through our doors as a freshman and honestly, we don't really want you to. We do want you to become invested in the Mayfield community in and out of the classroom. Having made a strong transition and discovered your academic footing, sophomore year is the time in which we encourage you to challenge yourself scholastically, working hard in the classroom and honing in on your interests. Now is also the moment to start deeply pursuing your passions, whether they manifest within athletic, artistic or service oriented fields. This is when the college admission process begins in earnest. As soon as you take your first semester finals, we get started. The conversation opens not with the colleges, but with you. We will ask you to reflect on what it is you really want for your college experience, your strengths, challenges, ambitions and personality. The soul-searching is first. During the senior year, students will have the challenge of juxtaposing two skill sets in order to work through the admission process. On one hand, you're encouraged to think broadly, deeply examining your personal strengths and needs, and doing some serious reflection, all with the goal of uncovering a balanced list of colleges that you are thrilled to apply to and that you love! On the other hand, this process is filled with details and deadlines, and you must remain fully organized and in tune to all the minute pieces that need tending.